Jam Packed Opening Week To Welcome Back The GreenJackets! 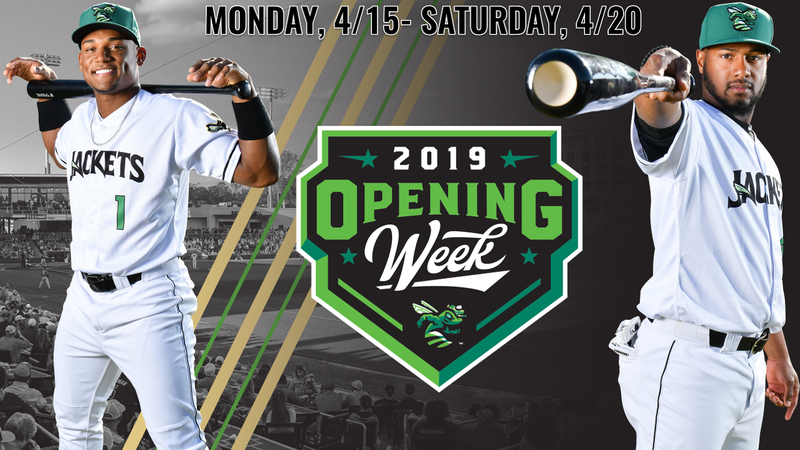 NORTH AUGUSTA, SC: The Augusta GreenJackets, South Atlantic League affiliate of San Francisco Giants, welcome back the CSRA to the 2019 Opening Homestand starting on Monday, April 15th- Saturday, April 20th. The GreenJackets will play the Greensboro Grasshoppers (Pittsburgh Pirates) for three games (4/15, 4/16, 4/17) then conclude their homestand with three games against the Charleston RiverDogs (New York Yankees) (4/18, 4/19, 4/20). 2019 Opening Day- Enjoy the pageantry of Opening Day. Help #PackThePark and welcome your GreenJackets back to the CSRA. Pre-Game Concert starting at 5:30PM by American Idol Top 40 Finalist Clay Page. The first 5,000 fans will receive an SRP Federal Credit Union Rally Towel. Wear your GreenJackets green and help us #GreenOutTheRiver. With a valid Military ID, patrons will also get $2 off ticket pricing when coming to the SRP Park Box Office for Monday games. Tuesday Brew & Q presented by Maurice's BBQ. Every Tuesday, the GreenJackets will have a $3 special on beer and have a Maurice's BBQ special of the night. Students from all over the CSRA who hit a home run and achieved their reading goal through our Auggie's Book Club are rewarded with a night out with not only their school but also the GreenJackets. Auggie's Book Club is presented by: California Dreaming, Kona Ice, Put Put Fun Center and SRP Federal Credit Union. The GreenJackets will have a player come out and read a quick story to the students before the game (6:10). The Auggie's Book Club parade for Home Run hitters will be at 6:20. On each of the Auggie's Book Club nights, the GreenJackets have teamed up with United Way and SRP Federal Credit to help give back to the community with the Book Bash. The GreenJackets, United Way and SRP ask guests to help them in this initiative by bringing lightly used or new books. Nick, Nick, Nick, Nick, Nickelodeon! Get ready for some of your throwback favorites and today hit Nickelodeon shows as we celebrate Nickelodeon in itself! Education Day #1, The stadium opens early for a 10:35 AM Education Day Game. It's the field trip CSRA-area students look forward to all year! Gates open at 9 AM. It is everyone's favorite time of the year…CHEAP BEAR SEASON! The GreenJackets will have $1 Natural Lights and PBRs along with other cheap beers throughout the game. Ladies Night Friday where the GreenJackets give it up to all ladies coming out to SRP Park on Fridays with prizes! Ladies Night is presented by: Oliviana Ristorante, Palm Beach Tan, Pure Bare of Augusta and The Swank. The first 2,000 guests will receive the official 2019 GreenJackets Team Photo presented by: California Dreaming, Kona Ice, Put Put Fun Center and SRP Federal Credit Union. To go along with Auggie's Book Club night, the GreenJackets celebrate some of the top children's books that everyone loves, Dr. Seuss stories. Get ready to see the Cat in the Hat and much more! Kids 12 and Under after the game are welcome to run the bases just like the GreenJackets! Come out and enjoy the First Fireworks Extravaganza where the GreenJackets will not only light up the field, but will light up the sky presented by Georgia 811. Pre-game Saturday's Concert Series will be back with a performance by local CSRA native, Adam Harris Thompson, starting at 4:30 pm.